Why not start 2011 by tackling the "pile". You know, the paper pile that sits on your kitchen counter or dinning table and stares you down when you're in the room. A solution that has worked for me is using an accordion file holder (photo below). The very front of the holder contains a "put away" section for things that need to be filed elsewhere at a later date. The rest of the sections I use are for things I've clipped from magazines that don't necessarily belong in a file cabinet, but that I want to refer to at a later time. You could also have a section for "bills to pay" (I don't do this because I wouldn't look for them in that spot). This system really has helped me turn my piles into a organized drop spot. I store the holder on top of my refridgerator for easy access. Sometimes I feel like I just want to give up trying to eat "clean". It's a ton of work, can be pricey, and people treat you like a freak of nature for being "natural". I feel like most products are pure lies and it gets discouraging. Almost every change that's taken place around here has come with a LOT of research. Mostly because I never take what the media or government says at face value. Anyway, we've cut way back on our meat/chicken consumption. We don't eat it unless it's grass fed/organic but because of how pricey it is we decided to use more soy products (ie; organic soy milk and tofu). It took me a while to find much information on the topic and now that I have,I am sorry to say that even soy has it's hang-ups (and lots of them). based on the information I found, I've decided to rarely use soy products at all. And that's only SOME of the risks of soy consumption(please read the entire article HERE for further information). Also note that Americans consume much more soy than we realize due to excessive food additives/processing. The verdict is still out, but until we know for sure, I don't want my family to be part of the experiment. I wish eating safe food didn't have to be so hard. Thanks for listening to my vent and remember to reduce your exposure! Big snow storm here today in the Twin Cities. What better way to spend it than enjoying some warm healthy soup?! Found this recipe online and adapted it a bit. It's easy, healthy, and delicious. 4. garnish with green onion and plain yogurt and enjoy! I try to plan the next weeks dinner before I grocery shop the previous week. I also try to use certain ingredients a few times. For the above menu I use kale both Tuesday and Friday, so nothing goes to waste. Also, I usually make Monday-Thursday's dinners on Sunday while my husband watches the kids. With a little planning and preparation it's totally do-able to have healthy budget-friendly dinners on hand. I am a little bit of a germ-o-phob, but we got rid of all our antibacterial soaps (trust me- I HATED parting with my fancy soaps). Numerous studies have proven that plain soap and water are just as effective as their triclosan containing counterparts. In our house we use Trader Joes "Next to Godliness" handsoap. It's important to note that you won't get the typical "sudsing" effect when you use the pure stuff (God only knows it takes some chemical magic to make that stuff suds up like it does). Minnesota congresswoman, Betty McCollom has called on the FDA to ban use of the toxic chemical. A full review of the product is expected to congress in April of 2011. In the mean time, please do yourself a favor and be anti-anti-bacterial. I do not wear much make-up. But getting older combined with getting less sleep is the perfect equation for under-eye circles. Getting rid of my conventional-chemical laden make-up was one of the last things I did. Mostly because of the price of organic make-up and I sure as heck wasn't about to go without anything at all. 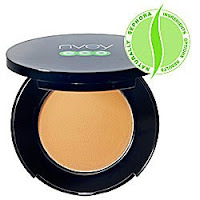 After lots of research I found NVEY ECO erase concealer and it works pretty well. Unfortunately it's about 30 bucks (I got it half off for $15), but a little goes a long way and for me it will last close to a year. It's worth the price for the peace of mind that I'm not putting harsh chemicals near my eyes on the delicate under-eye skin. If you decide to purchase this product I recommend putting it on right after your under eye cream for optimal smooth finish and easy application.